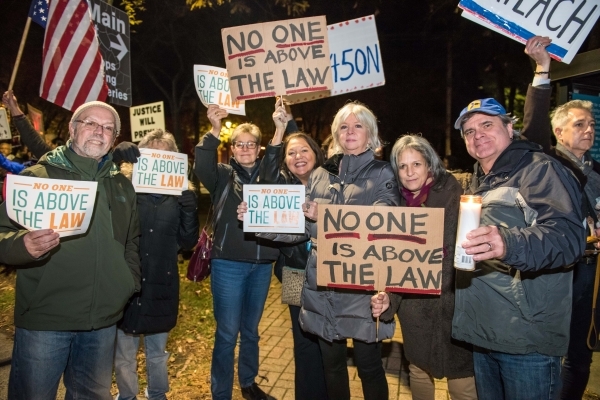 On Nov. 8, about 200 people gathered at the intersection of Route 9D and Main Street in Beacon to protest President Donald Trump’s replacement of Attorney General Jeff Sessions with Matt Whitaker in a clear move to thwart the power of the Mueller investigation into Russian influence on the 2016 election. The protest was one of more than 900 scheduled to occur across the country. Ours included children, grandparents, commuters coming off the train, people with their dogs — everyone showed up with signs and spirit to stand up against what we see as a power grab. Conversations included how scary it is to see the checks and balances in our democracy unravel. The mood was generally light, with lots of hooting and hollering whenever a driver honked in support. A few drivers shook their heads or gave a thumbs-down, and a dozen or so went out of their way to roll down their window to shout curse-riddled diatribes. A few were stunningly hateful.